In my mind there can be little doubt that the best time to practice yoga, the time that will offer us the greatest benefits, is first thing in the morning before breakfast. This is not to say that going to yoga classes in the evening is not beneficial; some forms of yoga such as calming and grounding Yin Yoga are perfect to unwind after a long and stressful day; but if you want to gain the most from your yoga practice then developing a morning yoga routine is definitely what I think you want to aim towards. There is some undeniable logic in this: when we warm up and stretch our tight muscles stiff from lying for hours in bed, perform some deep abdominal breathing, lie serenely in savasana relaxation pose and even possibly sit quietly and meditate – and all before breakfast – we are starting our day with a serious bang and carry all the positivity generated with us throughout the rest of our day. This morning practice and the wonderful feeling it has consistently given me, is what really got me addicted to yoga. I was working in a demanding job and often woke with a dread of going to work and facing stressful meetings or dealing with a large workload; I’m sure everyone has felt this feeling at some point in their lives. But when I began practicing yoga what I soon understood was that all I needed was my yoga mat and motivation to get up a little earlier in the morning, and I could have a profound impact on the direction and quality of my day. My usual routine is to warm up from the head down including all the areas that get stiff in the night like neck, shoulders, hips and ankles; then when I’m sufficiently warmed up I do a few rounds of Sun Salutations that include forward and back bends, strengthening poses like Plank and Down Dog and other favourites like Cobra and Lunge. 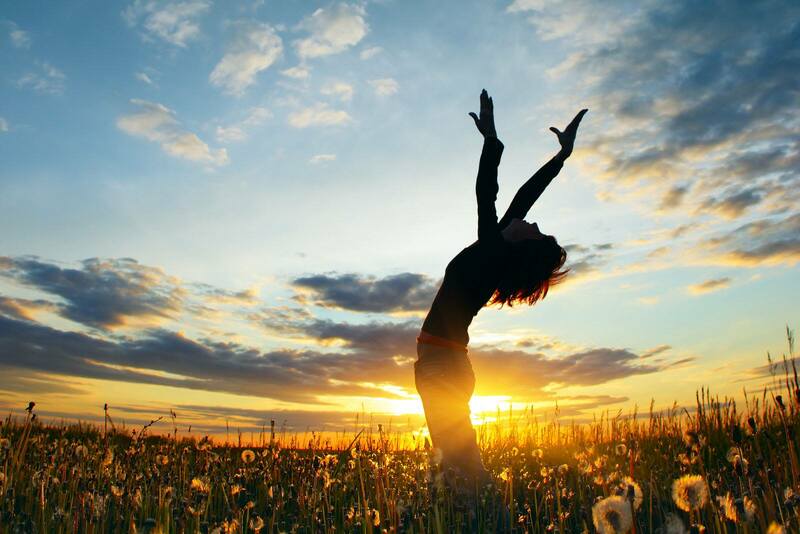 Sun Salutation really has it all and is performed in time with the breath and promotes deep abdominal breathing which brings energy, calmness and other mental benefits. Next onto my back for a few leg raises to keep my core strong, perhaps Bridge Pose to open the chest and lungs, followed by a twist and then ending with my all time favourite of Shoulderstand to really wash away the cobwebs and relax me…that’s usually it, 30 minutes and often less if I’m pushed for time. The secret is regular morning practice, whatever you can manage, daily is best, even if it’s only for a few minutes. Your whole being will respond with relish to the love that you are sending it through your practice and your day can only be improved as a result. Why not give it a try and let me know if it works for you?